Perceptica (www.perceptica.com) is a team of professionals specialised in creating innovative in-depth reports based on online media analytics. Mapping brand perceptions among customers provides valuable insights for helping brands, individuals and organisations thrive. This survey monitors sentiment towards the events in Greece in the light of the referendum on accepting or rejecting the agreement with the country’s creditors. Social media comments, blog posts, forum discussions, and comments in news media outlets were analysed to outline public attitudes in eight countries in Southeast Europe (SEE). The report covers over 1200 online comments published during the period immediately prior to and after the July 6 referendum. In Bulgarian social media, sentiment towards developments in Greece was predominantly negative. Positive opinions and voices in support of Greece were outnumbered by negative comments almost 2 to 1. A general notion throughout online comments was that “debts ought to be paid” and that it was unfair for certain countries to be exempt from paying debts. Negative attitudes were especially prominent in regard to prime minister Alexis Tsipras and his government, as nearly a half of all mentions of him and his cabinet were negative. Greek people, however, attracted more sympathy, as commenters often noted that they had to endure a regime imposed on them by “thieves” and “failed Communists”. Sentiment towards Greece’s creditors, on the other hand, was rather neutral. Only a few commenters blamed the Troika for the situation in Greece or hailed its actions. Bulgarians’ view of the EU and its leaders though was more nuanced, especially in regards to German Chancellor Angela Merkel, seen by most as a key player in the Greek crisis. Positive comments about the EU outnumbered those accusing the bloc of being too passive or of “trying to get rid” of Greece. A number of Bulgarians noted Russia’s role in the crisis and its attempts to alienate Greece from Europe. Some 16% of commenters covered by this survey blamed the situation in Greece on Russia and its president Vladimir Putin. Conversely, about 4% were of the opinion that Moscow offers Greece the only escape from the “greedy creditors”. The effects of a possible GrEXIT on Bulgaria were not a hot talking point for Bulgarians. Their comments were predominantly neutral and concerned mostly the state of Greek banks in Bulgaria. 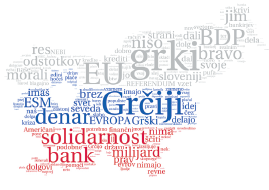 In Croatia, sentiment towards the situation in Greece very much resembled that in Bulgaria. As members of the EU, Croatians were not happy to see someone bend the rules, as they perceived the Greeks to be doing. Hence, they were less than appreciative of the actions of the Greek government, which many saw as Communist, and therefore “detrimental to Greek people’s interests”. Croatians tended to sympathize with the people of Greece to some extent, although in some cases they were described as “greedy” and “lazy”. While Greece’s creditors were seldom a topic of conversation, the EU was a matter of heated debate. Unlike other countries in the region, the discussion in Croatia was not as focused on German Chancellor Angela Merkel, despite an occasional mention of her name. The big talking point was whether Croatia had actually benefited from joining the EU, with the majority of commenters holding the view that membership in the bloc was good for their country. Nevertheless, many were dissatisfied with the EU, especially in the wake of the Greek crisis and the prospects of being forced “to feed the Greek vultures”. Slovenia was also mentioned in a notable amount of comments in connection with its unique situation as an euro area member state that has already subsidized Greece with some 1.6 billion euro, as most commenters expressed doubt about Croatia’s own potential euro area accession. Many Croatians also noted that their country was in pretty much the same situation as Greece and should carefully consider its next move. A small minority of comments suggested that the Greek crisis would, in fact, be beneficial for Croatians as tourists would now opt for the Adriatic resorts. 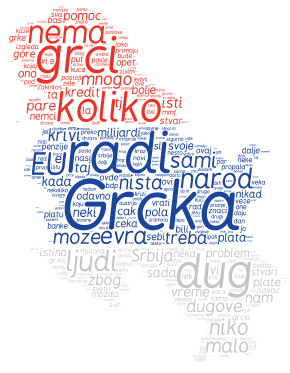 As could be expected, given the long-standing conflict with Greece over the name of their country, Macedonians were rather negatively disposed to their southern neighbours in their online comments – Macedonia is the only country among those included in the survey where commenters expressed a predominantly negative sentiment towards Greece. Furthermore, the negative comments outweighed not only the positive ones, but the neutral ones as well. They often implied that Greeks were, in fact, digging their own grave, while trying to “destroy Macedonia”. Nevertheless, voices in support of Greek people could be heard even in Macedonia. Some Macedonians said they wished their compatriots were as active on political issues as the Greeks, drawing a clear distinction in the perception of Greek people, on the one hand, and the Greek state and political elite on the other. Commenters often made fun of the hypocrisy of Macedonians who love to badmouth Greeks but when it comes to summer holidays Greece remains the top destination for Macedonian tourists by a clear margin. Macedonians’ negative sentiment towards Greece projected itself onto the EU and its leaders, as well. Commenters claimed that the bloc had failed to do enough to humble the Greeks and teach them to respect the rules. The view that Europe would do well “to get rid” of Greece was also rather popular. Comments on the effects of a possible GrEXIT on Macedonia were relatively few but rather polarized. About 8% of commenters saw a GrEXIT as a great opportunity to finally get around the Greek blockade on Macedonia’s EU and NATO accession. Another 6%, however, warned of a possible negative impact given their country’s dependency on the Greek economy. The opinion of Serb internet users had its specifics stemming from a multitude of factors, including the historic Serbo-Greek friendship. Thus, Serbia was among the few countries in the region where attitude towards Greece’s actions was pronouncedly positive, with commenters speaking about the “heroic” Greek people. Negative sentiment towards Greece was mainly prompted by articles about the extent of corruption in the country, a major factor contributing to the debt crisis. In this context, Greeks were described as “typical Balkan people”, and “same as the Serbs” – a rather negative notion, according to commenters themselves. While Greece’s creditors failed to attract much attention, the EU and its leaders were often depicted as the villains in the story. Less than one fourth of comments showed a positive sentiment towards the bloc. About half of all comments, on the other hand, spoke negatively of the EU, with a substantial portion of them calling for a referendum on Serbia’s future EU accession. Commenters said they wanted the Serb people’s voice to be heard the same way that of the “brotherly” people of Greece was heard. Russia’s involvement in the Greek crisis was another issue that triggered polarized opinions. Negative sentiment towards Russia slightly outweighed the positive one, by 35% to 31%. Many of the positive comments called for Christian Eastern Orthodox countries like Serbia, Greece and Russia to group up against the West. On the other end of the spectrum, many commenters noted the “inadequacy” of Russophilia in Serbia. Moldova, with its large Russian-speaking minority, is a special case among SEE states. In fact, much of the debate regarding the Greek referendum took place in Russian. Naturally, Russian speakers were rather supportive of Greece and its people, congratulating them on what they saw as a “bold decision.” Anti-EU, anti-IMF, anti-US sentiment dominated, with many commenters expressing their joy at seeing Greece distance itself from the West. Many pointed to the fact that Prime Minister Alexis Tsipras was the only leader of his country in recent history to have graduated from a Greek university and not a U.S. one. Moldova was the only country included in the survey where the U.S. was mentioned almost as frequently as the EU in connection with the Greek crisis. A large number of comments in Russian touched upon relations with Russia, slamming Russophobe politicians in Moldova. Commenting on articles covering the problems of the 20,000 Moldovans residing in Greece, they shared the view that Russia was a much better destination for Moldovan migrant workers than Greece could ever be. Opinions voiced in Romanian were rather less nuanced than those in Russian, with a much larger portion of neutral comments. Negative sentiment towards Greece and its people prevailed slightly over positive. Commenters emphasized the fact that Greeks were to blame for their country’s uncompetitive economy. They further argued that Greeks had long enough lived as parasites on the back of the EU. There were voices in support of the Greek people, saying they were “hard-working” and “did not deserve such a fate”. Far fewer voices were raised in support of Tsipras, who was nevertheless seen as a better option than Moldovan politicians “who want to sell their country to the Russians”. Only 26% of posts in the Slovenian social media covered by this research were neutral in tone. A large portion cited the statement of the Eurogroup president Jeroen Dijsselbloem, who warned that there would be no negotiations if Greece votes “No” in the referendum. The predominant sentiment was negative towards all the parties involved, as most remarked that Greece had nothing except its glorious history and seaside but thanks to the loans it had received, it had managed to keep its economy in good shape over the years. If these were taken out of the equation, Greece would be very much the same as Bulgaria, they asserted. Some of the most widely discussed topics were Greece’s uncompetitive economy and corruption at all levels. The EU’s solidarity with Greece was another point of discussion, as commenters were adamant that it was high time Greeks started working and repaying their massive debt. Users compared Greece to a “bottomless bag”, while others worried about the establishment of a military dictatorship in the country. Commenters were also rather critical of Greece’s lenders and the EU. According to some, the accumulation of huge loans by some countries was part of a plan by the EU and the creditors aimed at enslaving their people. There were also accusations against the banks based in France and Germany, which were perceived to be pocketing the money of the other member states. Some commenters, however, hailed Tsipras for “actually standing up against Brussels’ dictatorial ways”. Others praised the Greeks for being the only people with courage to stand up to the “foreign exploiters”. Thus, once again the word solidarity was used in calls to stand up for the people of Greece. The opinion of social media users in Romania on Greece’s financial issues was predominantly negative. The majority of the negative comments were directed at the Greek government and the Greek political elite in particular. 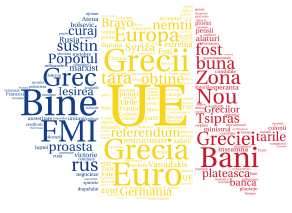 According to the Romanian commenters, Greeks had themselves to blame for their situation because they “lied when they entered the Eurozone and fabricated the data required for accession”. According to most, the political elite in the country is “hypocritical” and all politicians “lie and blame others for the country’s poor financial management”. Some were extreme in their comments, suggesting that the EU did not need Greece at all, and that no country could wait forever to get back the money it had given the Greeks. The creditors and the EU were also under attack. Many Romanians were baffled by the EU’s insistence that Greece remained in the Eurozone. They also expressed their dissatisfaction in regards to the financial management of the EU. Others described the situation in Greece as “the initial battle with the capitalist beast”, and expressed their compassion with the Greek people in their struggle with the corrupt political elite that was responsible for the financial difficulties in the country. 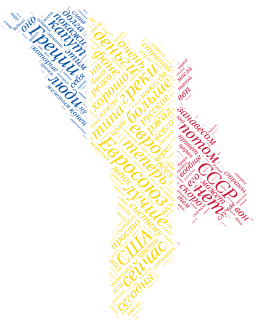 Overall, the Romanian social media users expressed a negative opinion regarding the decisions taken by Greek politicians and the corruption in the country, though some voiced support for the Greeks and commended them for what they saw as “courage to challenge the capitalist oligarchs”.